World Tuberculosis Day Part I – What is TB? Tuberculosis (TB), caused by the bacillus Mycobacterium tuberculosis, is an airborne disease that primarily affects the lungs (pulmonary TB) . This means that when people with pulmonary TB cough, sneeze or spit, TB bacteria are propelled into the air, giving them the potential to spread from person to person via inhalation. TB can affect other sites as well, including the brain, the kidneys and the bones . An ancient disease, TB has affected humans for over 4,000 years . In many cases, the immune system will fight off the TB bacteria, and no infection occurs. If the immune system is not able to completely fight off the bacteria, some inactive bacteria may stay in the body, leading to latent TB infection (no symptoms). If the immune system does not respond sufficiently, active TB infection occurs (TB disease), and symptoms begin to manifest . People with latent TB infection cannot spread TB bacteria to others, but can go on to develop active TB over time. WHO estimates that about one-third of the world’s population is infected with latent TB . Symptoms of TB disease include a persistent cough of 3 weeks or longer, pain in the chest, coughing up blood or sputum, weakness or fatigue, weight loss, loss of appetite, chills, fever and night sweats . The burden of TB is mainly concentrated in low and middle income countries, where 95% of TB deaths occur. In 2014, there were 1.5 million TB deaths, and 9.6 million people developed TB disease . TB is one of the leading causes of deaths from infectious diseases worldwide . The map below, produced by WHO, shows estimated TB incidence rates, by country, in 2014. 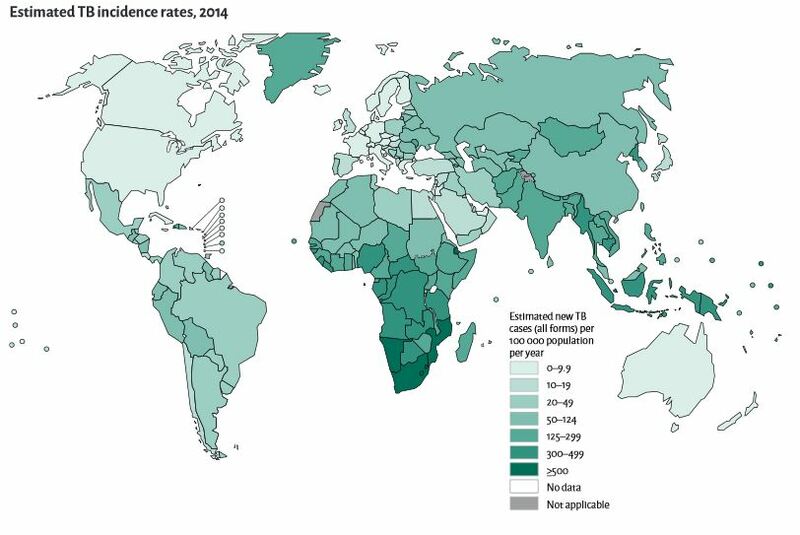 Map of the world showing estimated TB incidence rates, by country, in 2014 (Source: World Health Organization). This map provides a visual representation of the worldwide burden of TB, with the lowest rates in Western Europe, Canada, the United States of America, Australia and New Zealand. This has led to a common misperception in higher income countries that TB is a disease of the past. However, in many countries, including Lesotho, South Africa, Swaziland and Mozambique, rates are still above 500 cases per 100,000 population . Keep reading our series of blog posts on TB to learn more about risk factors, diagnosis, treatment and much more.